Bathroom vanities and sink consoles are often the focal point of your bathroom since they take up so much room in such a small space. Whether your space is big or small, widely used or only occasionally, you’ll want to put some thought into your bathroom vanities and pick one that compliments your space. We have custom Vanities and Vanity Tops available to order or we have pre-manufactured vanity choices available thru our Sister Company Vanity Calgary. Which should I choose: a bathroom vanity or a sink console? Your choice depends largely on the space available as well as your storage needs. Sink consoles tend to be smaller, so they’re great for powder rooms or guest baths. While they often don’t come with storage beneath the sink, you can still find those that come equipped with a small enclosed cabinet if need be. Bathroom vanities are usually larger, so they work well with master baths. What size bathroom vanities work for my space? You want your bathroom vanity to be in proportion to the overall size of your bathroom as well as other bathroom fixtures. Be sure to carefully measure the area where you want your bath vanity; at the same time, consider the placement of the surrounding fixtures. If a door is nearby, open and close it to make sure its path is clear. Single vanities are ideal for a small powder room or guest bath, whereas a double vanities are preferred for a master bath. 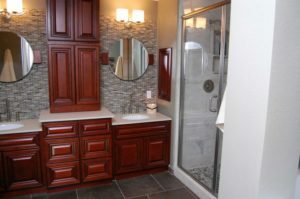 What types of materials are available for bathroom vanities? Wood vanities provide a natural feel, but can be a bit pricey if you choose to go with solid wood. Medium Density Fiberboard, or MDF, is less expensive and more durable after it’s covered with laminate. If you have a smaller bathroom, consider a glass vanity for a timeless feel that will help your space look larger. Particleboard or plywood are good options for lower budget vanities, just be sure to get top quality for your money or you may find you’re replacing it sooner than you prefer. What if my bath vanity doesn't come with a top? Oftentimes vanities are sold only as cabinets, leaving you to decide what to top it with. There are two choices: bathroom vanities with tops or just a vanity top. As the name suggests, bathroom vanities with tops come complete with a sink bowl built into the countertop. If you’ve already picked out a separate sink, the vanity top may be a better choice. However, be sure to check whether the top already has holes cut out that are compatible with the shape and size of the sink you chose. 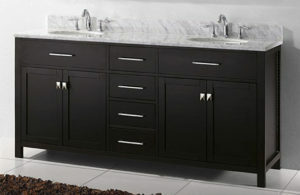 Sinks, faucets, drainage, backsplash, tiles can all be source thru our sister company in Vancouver, Calgary and Edmonton. Consider the space the vanity is going in. 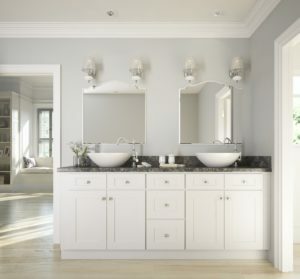 A master bath will require a larger size bathroom sink cabinet, whereas a powder room will need a smaller size. If you have a small bathroom, choose a small sink cabinet with a lot of storage either under the sink or to the sides. If you are unconcerned about size, consider a cabinet style with decorative elements and bring in extra furniture for storage purposes. Match the style of cabinet to your existing design. A modern vanity in a Tuscan-style bathroom can throw off the look. Examine your existing kitchen cabinets and fixtures. Take note of what you don't like and what you wish you had to make the shopping experience less painful. If you are an older citizen and plan to stay in your home through retirement, consider getting pull handle hardware. For arthritic hands, pull handles are easier to maneuver than knobs. If you are having trouble finding the right hardware finish, match it to the existing faucet or door handle finishes.